It’s nigh on impossible to entertain guests on your superyacht without broaching some fine Champagne. In fact there’s probably a maritime law somewhere insisting upon it. And if you really want to do things in style, the Champagne ought really to be in magnums or even jeroboams. 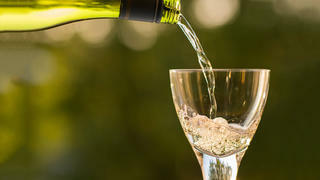 Stock up with fizz at the nonpareil Wine Palace Monte-Carlo (winepalacemontecarlo.com), based at the bow of the Yacht Club de Monaco, and have the wines delivered to your yacht in its fleet of temperature-controlled vans. Bollinger has just released £250 jeroboams of its Special Cuvée (non-vintage to you and me) in the elegant “1846” bottle shape, unique to Bollinger. A double magnum such as this is ideal for floating fizz-based festivities this summer, a superb Champagne in the most party-friendly of sizes. Or if you want to show off a bit, get some magnums of Comte de Mazeray Brut Champagne from Gold Emotion (goldemotion.com), a luxurious fizz complete with flakes of 24kt gold floating inside the bottle (£280, cave-champenoise.co.uk). You can have your guests’ names engraved on the bottles. 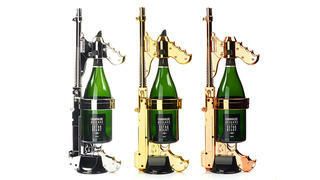 Of course, if you’re feeling really profligate you could invest in the Champagne Gun ($499, champagnegun.com), a bonkers contraption that looks like a machine gun (available in gold, rose gold or chrome) and into which you load a magnum of Champagne. The fizz will be shot and sprayed into the air some seven metres (or all over your rival’s superyacht) and the magnum will be drained in just 45 seconds. In order not to be too decadent, I suggest using non-vintage ammunition (Cava and English sparkling wine will also work). While Champagne is guaranteed to make your guests feel special, an exquisite red Bordeaux will have a similar effect. Head to Hedonism Wines (hedonism.co.uk), the wine lover’s paradise in London’s West End, where you can pick up all four of the red Bordeaux wines produced by SGC Wine – Pomerol, Pauillac, St Emilion and Médoc (from £123.50, for a St Emilion Grand Cru 2006, to £291.70 for a Pauillac 2009 Bruno Ménard). They are true rivals of the region’s First Growths – and just as impressive as all that bubbly.